The WWE Universe was getting ready for a normal match between two WWE Superstars. Little did they know the match would change the lives of both odd them forever. The Igloo in Pittsburgh, Pennsylvania had been prepared for a Hell in A Cell match between The Dead Man UNDERTAKER and The Mankind MICK FOLEY. Before this match, hell in a cell was just a common match where two wrestlers were locked inside a cage and were literally given everything, starting from chairs, kendo sticks, takes etc. to beat up each other. But this match changed the meaning of hell in a cell forever, it was redefined to be a cage inside of which the locked ones would face the true hell! It was the most barbaric, death-defying, violent match in the history of World Wrestling Entertainment. In one night, Mick Foley put his body on the line and sacrificed himself for the sake of entertainment, thus creating a legacy for himself as the one of the toughest, most respected WWE Superstars of all time. The setup to this match was even greater. The Undertaker was having a bitter sibling feud with his brother, King of the Ring Kane. The Dead Man beat The Big Red Monster in an intensely physical match at WrestleMania, and a month later again in the very first Inferno match. 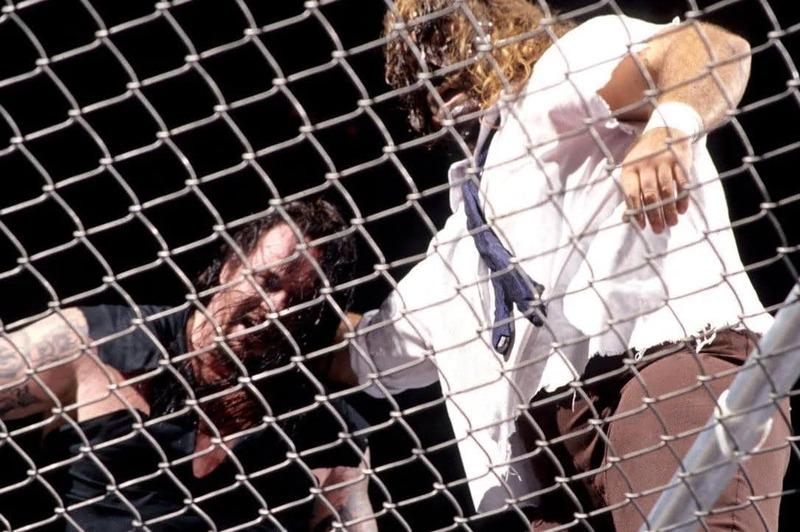 Jane was put into rivalry with Steve Austin, ego had been winning most of his matches till then, and Mick Foley returned as The Mankind, one of his three personas, and rekindled his rivalry with The Undertaker, thus seeing up a date at The Hell In A Cell. No matter how famous and respected both the stars were before the match, it became the highlight of each man’s career. Foley came out first, and God knows what was going through his mind, he wanted the match to happen on the steel cage. And there he was, at the top. As The Undertaker came out, he was challenged by Foley to fight the match on the top. As the match started, Foley had the control as he mounted some punches to his opponent. The first few minutes saw Foley gaining on the Dead Man, but the worst, most remembered moment of the match came when Foley recurrence his first bump, which was being thrown down from the top of the cell about 22 feet down onto the Spanish announcers’ table. This triggered announcer Jim Ross to shout the famous dialogue of the era, “Good God almighty! Good God almighty! That killed him!” and “As God as my witness, he is broken in half!”. Mick remained motionless under the debris, not moving even an inch, while The Undertaker was on the top of the cell starting down. 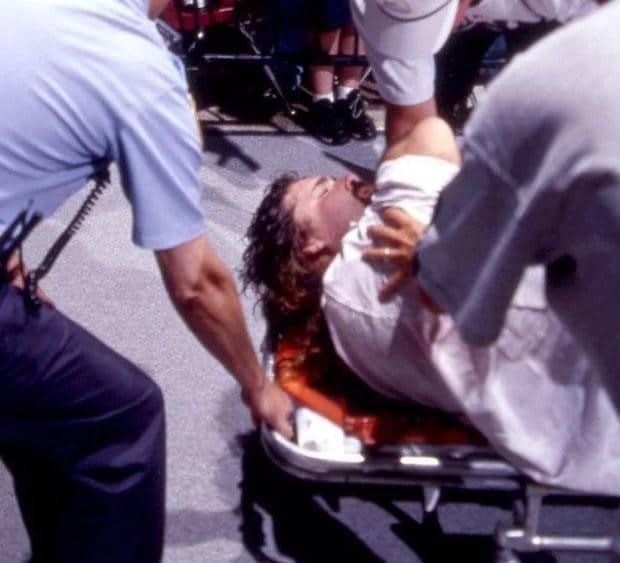 The broken man lying down was attended soon by his longtime friend Terry Funk, followed by WWF’s resident doctor, Dr. Francois Pettit, and various others, including Vince McMahon, who looked much worried though on paper he disliked Foley. Immediately Foley was wheeled out of the arena in a stretcher and the match was stopped. Foley gig his second bump of the night when he was choke slammed through the cage onto the ring. No one had thought that the cage would give way under Foley and The Undertaker. For a few moments, he was knocked unconscious, but was able to come around soon. According to the announcers, the prop guy had intentionally made the cage look, but not so that it would just give away. Undertaker after the match said that he had thought that Foley was dead, but he regained well. As he got up, Foley was still smiling through his bleeding lips and teeth, with his one tooth over his nose hanging. It was later found that the tooth broke when he landed face first on the chair he was holding. Foley in his autobiography ‘Have a Nice Day: A Tale of Blood and Sweat socks’ stated that he would have been dead, but was safe as he didn’t properly receive the chokeslam. He said it was the best and the worst choke slam he had received. Foley later explained that the roof of the cell was supposed to sag sufficiently so that Undertaker could kick him through, allowing him to dangle by his feet and eventually fall in a rotation to land on his front. But that didn’t happen. The match continued for a while longer, ending with Foley being choke slammed by the Undertaker onto a pile of thumbtacks, which Foley himself had strewn onto the ring canvas, and The Undertaker executing the Tombstone Piledriver to end the match and the feud as planned. Both wrestlers received a standing ovation for the match. In 2011, this incident was named as the number one “OMG!” incident in the WWE history. 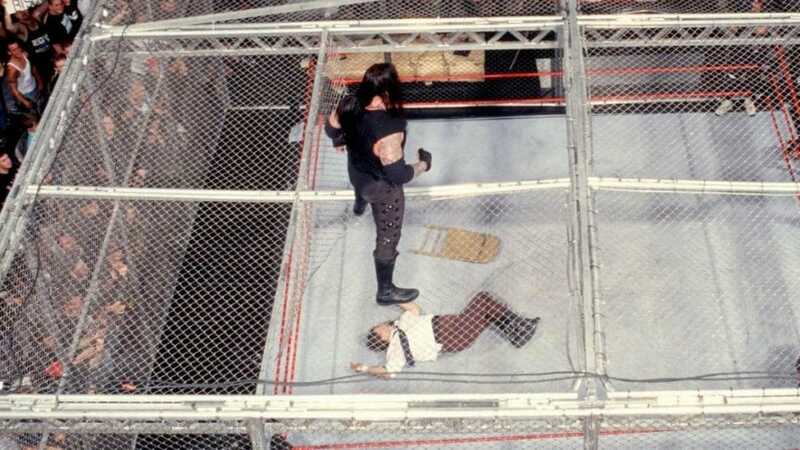 Both participants have said that the original Hell in a Cell match, between The Undertaker and Shawn Michaels at Bad Blood: In Your House on October 5, 1997, was superior; The Undertaker named the Bad Blood contest as his favorite match, while Foley called it the greatest Hell in a Cell bout ever.